Chances are if you go to the doctor you will have a short conversation, a quick check up and some blood work. When your results come back your doctor will call you in to discuss your findings. If your doctor practices medicine as a modern practitioner and there are any problems found they will look to find a prescription for you to take. The same thing has happened in business. Companies look at business indicators, take into consideration the technical factors and come up with technical and process oriented solutions to change the business in order to increase overall business effectiveness. The result in both cases is that we treat symptoms and not the root problem. The problem is that it is very costly and time-consuming to treat the problem. Treating a symptom is fast and effective. It is a quick fix solution that may delay or push back the need to address the root problem. The problem is still there and both your doctor and business leader are just potentially exacerbating the situation by masking the problem. Why don’t we change our behavior? I have been wrestling with this question for a long time. I have read a lot of books and articles on this subject and my team and I have come up with ideas and tested them in the workplace. It boils down to the same thing over and over. It is about consideration for people relative to a quick dollar. Let us say in the scenario first presented with the doctor that when you went in to the office, you spend more time and money up front with the doctor. The doctor gives you a much longer diagnostic, they ask about your life and your family not in passing but in detail. They talk to you about your food intake and your stress levels, they look at your schedule for work and home and they do some research on your life. They would in this case look to learn more tacit information. It costs too much money. It will cost too much time. It would be expensive for you and the doctor in many ways that doesn’t require a breakdown because this is something you already understand. It is the same with business. If the business has to invest a lot of time and resources even with a long-term vision, it won’t spend money on people. That’s it! People are the most important aspect of any business or practice but the way our world works today we look to think about short-term people strategies and short quick fixes. This short-term thinking has been very expensive itself as it creates a whole slew of new problems and new technologies. In every aspect of our lives we now look for short-term and quick solutions. Think about it. From 30 minute meals to 60 day exercise routines that will bring you quick results. Take the pill and you will be better. Buy a technical solution and it will fix your business. If we are going to start seriously addressing the problems at work and at home, the first problem we need to really deal with is asking ourselves about what we are willing to invest. We will have to ask ourselves how important the problem really is to us and how much time we want to even think about it. If you want a quick fix and have a desire to pretend that everything is ok, take a pill and be on your way. If you want to really deal with the issues at hand, there will be pain and sacrifice, there will be an investment on your part, and there will be tough choices. The funny part about this second option is that other problems could come up and all your work could in fact be for nothing. This is just reality. Even with that being the case, what is the effort worth to you in the long run? Start asking these questions and you may find out that it is worth more than you know. Previous Who is Responsible When Crowdsource Becomes Murder? Very topical. I see this all the time, not just in business. 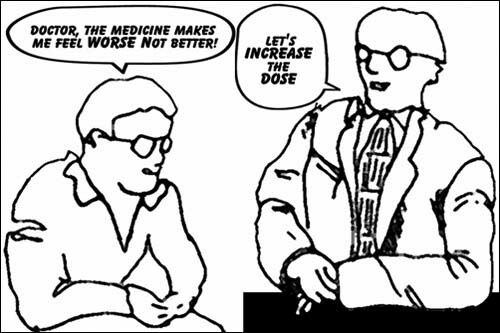 I bet most of the world’s economy is spent on addressing symptoms, not problems. Agree with your “reality check” Howie. However, I think that there ARE solutions that can address the problems by treating them as symptoms. What practitioners have to do is to create services for the symptoms that are most closely linked to the deeper problem as a function of differentiating deeper, more persistent problems. The lab test rules out more rare or specialized threats for the pill-dispensing physician; the same is beginning to be understood by those who care for the mind and the emotions by observing the actions of the brain and body. The beauty of Dave Eagleman’s argument in “Incognito” (BTW, a life-changing book you recommended!) is that we have three “brain” functions within the one organ, but barely use the one we have conscious connection with! The other two–the unconscious and the non-conscious–take care of the majority of our life-threatening, critical functions. Unfortunately, they often do so with faulty parameters for action, i.e. a traumatic childhood event, a misinterpreted statement by a teacher or girlfriend. What needs to happen among the “doctors” who care for people’s minds and bodies is to be put in touch with the technology that they could use to track those other datapoints to gather the “hidden” lives of our bodily systems, just as the body does with its unconscious limbic system and non-conscious autonomic nervous system. With this approach, the human specialist’s expertise would guide an improved technology observational assist, gathering data on all the hidden interactions that affect the symptom. Then physicians, nutritionists, physical therapists, social workers, and psychologists could collaborate with a person’s CPA, IT specialist, and executive assistant in doing more interdisciplinary work together through social networking-based research in a similar way. This interdependent human-machine interaction process would then provide more specialized assistance to caregivers. When a client/patient/counselee, etc. “sees” a symptom that concerns them, they can be provided not only a solution that “fixes” their symptom, but also provide their care-givers with further quantitative assistance to justify attention to emerging symptoms regarding the deeper issues.